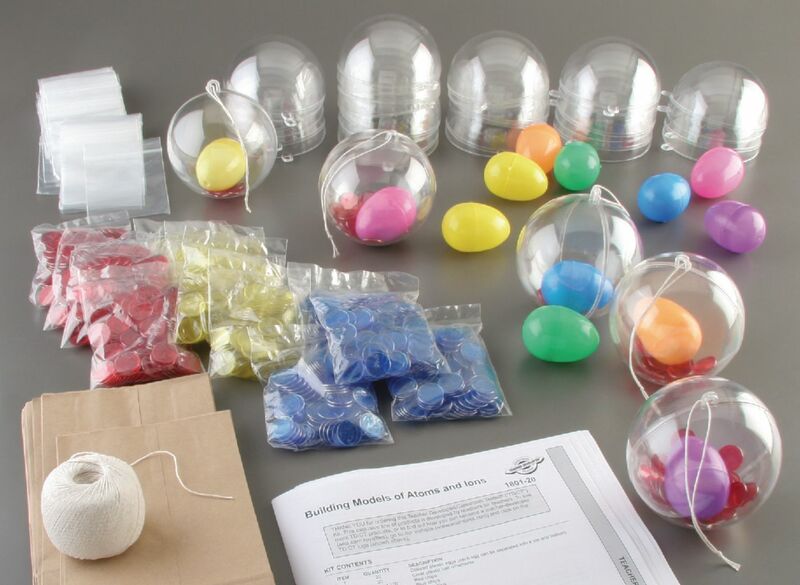 Many variations of model building are possible with this visual kinesthetic activity. Manipulative representations of atoms, isotopes, and ions are created using various plastic parts. A colored egg represents the nucleus, containing the yellow chips for protons and blue chips for neutrons. Surrounding the nucleus is a clear sphere for the electron cloud, containing red chips for electrons. Structures are created by simply placing the appropriate number of protons and neutrons inside the nucleus, and the correct number of electrons in the electron cloud sphere. You can specify the atomic/ionic model for students to build or you can create atoms, isotopes, or ions for students to identify. The models disassemble easily, allowing students to count the number of protons, neutrons and electrons, so they can determine their atom’s identity. For entire class discussion, the chips can be viewed on an overhead projector. Developed by Fran Zakutansky.